Rustam Usmanov’s art amply reflects the culture of the Fergana valley and the rich ceramic making heritage of Rishtan town, the oldest centre of ceramic art in Central Asia. 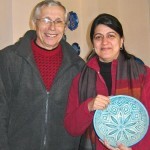 I travelled to Rishtan to see the ceramists who did the platters for me last year. It was bitterly cold and Rustam and his wife were very gracious, kept us warm (don’t miss their gorgeous home slippers!) and well fed while we worked on my order. The shavla – porridge version of plov – we had for lunch was delicious and Zahid and I tucked in. We couldn’t say no when Alisher invited us to lunch later so had to eat again! Tough job this!! I am amazed by how much time and effort Rustam and Alisher make for me. They are world renowned ceramists who earn very well doing exhibitions in the US, Europe and Japan and my orders pale in comparison. 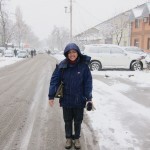 Day 5 – Snow in Tashkent! In the call of duty Nisha has not only traveled to faraway lands but she’s also braved heat, dust, snow, frozen extremities, alien food – all in the search for exquisite crafts. On our way back from Fergana to Tashkent, Nisha decided to visit a medressa in Kokand known to host workshops of the old masters. We stepped out of our car only to get lashed by icy winds. The bleak grey skies did not dampen her enthusiasm. Bundled up from head to toe, she checked every workshop and quizzed the masters. Rishton is the home to the craft of ceramics. An hour’s drive from Fergana, it’s a rather well-to-do town on the Tajik border. 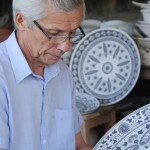 Ceramics made in this town find their way to all other cities in Uzbekistan. There are an estimated 300 practicing ceramists in Rishton. 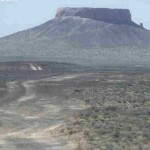 The red clay in this region forms the base for the stunning ceramic platters, pots and other decorative objects. 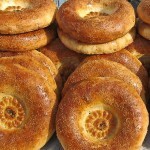 We left Tashkent this morning to drive to the Fergana valley. On our way, we dropped in at a contemporary ceramist’s studio. Over tea with macaroons and biscuits, he explained how his grandfather – a well known ceramist – had dedicated his life to documenting traditional motifs and ceramic techniques. Sections of his handwritten diaries could be seen in the family’s private gallery. This young man started learning from his grandfather when he was six years old. He said grandparents are more patient than parents! His own father is a renowned ceramist and had exhibited around the world. As we stepped into their gallery, we were introduced to many styles of ceramics – the Tashkent style, Steppe style, contemporary designs inspired by embroideries, traditional blue pottery and more. This ceramist clearly loved his work, spoke at an unhurried pace, and was rather tolerant as we gushed over his pieces.